A Gobble of a Deal! save BIG with free shipping on these great RoadRUNNER items! 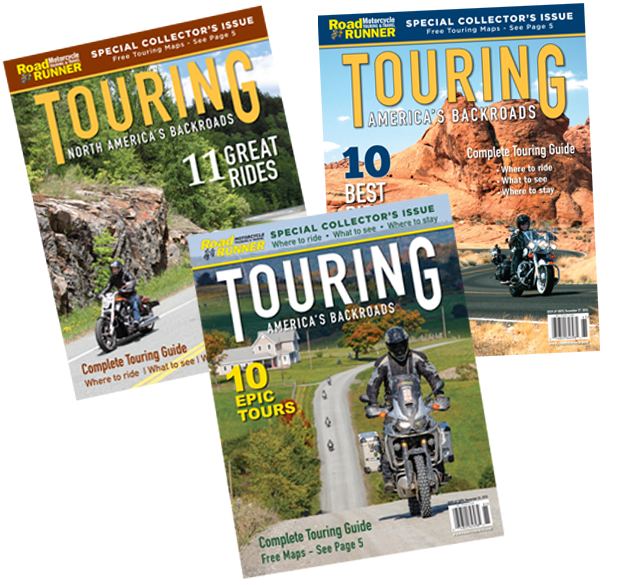 Our special collector’s issues showcase a regionally balanced mix of both previously-featured and new motorcycle tours with trip planning information and spectacular photography, as well as touring tips and special feature articles. Printable tankbag maps and GPS files are available for download with purchase. This bundle includes our Moto-Socks, baseball cap, and bandana. Road Maps – Start Planning for the Next Riding Season! Looking for more tour ideas? Stock up on road maps with detailed motorcycle routes, area information, and recommended points of interest. $9.95 each plus free shipping – or buy the entire collection and save even more!